The town of Petreşti (German: Petrifeld, Hungarian: Mezőpetri) was first mentioned in 1316. Back then, it was called Mezeu Petri. Petreşti belonged to the estate of the House of Kaplony, the ancestors of Count Károlyi. After the ownership rights had expired, the region was divided between the Houses of Károlyi and Vadaj. The relationship between the two houses was marked by conflict over the Petreşti estate. Since Petreşti was located on the main road connecting Satu Mare and Oradea, the town was subject to raids of different armies: Ottomans, Tartars, Kurucs, and Austrians. After the Kuruc Uprising, lead by Gerog Rakóczi II, was ended with the Peace of Satur Mare in 1711, Petreşti was completely depopulated. In 1740, Count Sándor Károly settled the region with Swabians from Württemberg who had been living in other villages around Satu Mare. Thus, the town was settled through domestic colonisation. In the 19th century, the town’s economic development was interrupted by two catastrophes: the earthquake of 1834 and the great fire of 1875. The worst catastrophe for the Swabians of Petreşti, however, was the deportation to the Sovjet Union in January 1945. More than 200 young Swabians were detained in work camps in Donbas in Sibiria for up to five years. Many of them did not survive the hunger, forced labour, sickness and cold. 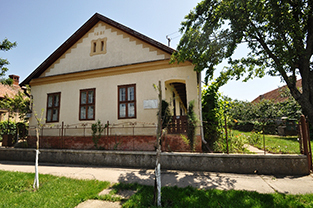 The number of Swabians in the Satu Mare region was diminished even further through migration waves from the 1980s onwards, which had their peak between 1990 and 1992. Many of them migrated to German, but still return to their old home once a year. Agriculture is, up until today, one of the most important economic factors in Petreşti. The town has small service companies and one flourishing restaurant, which also serves Swabian specialties. 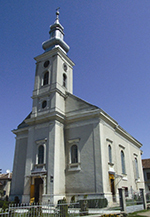 The Roman-Catholic church in the village centre is consecrated to Saint Elizabeth. It was built in 1786. In the earthquake of 1834, the church tower and the main nave collapsed and almost the whole building was destroyed. The reconstruction was begun after the great fire of 1875. István Vonhás (1881-1945) is a well-known linguist and historian from Petreşti who has conducted research on the settlement of Swabians in the region of Satu Mare. An obelisk was erected in the town hall park in his honour. 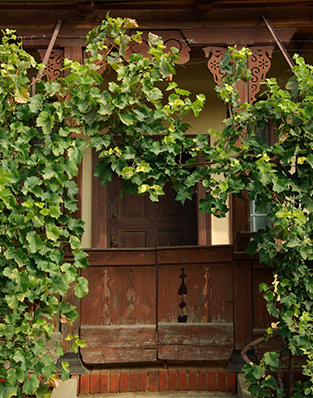 Vine arbour of an 1881 Swabian house, today a heritage museum. LEFT: The church of Saint Elizabeth, built in 1786. RIGHT: Ornamented furniture in the Swabian museum. 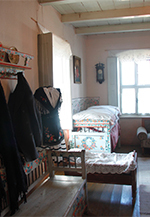 The little “Swabian Museum” offers a good overview of the heritage of the town and the Swabians of Satu Mare in general. It is located in a Swabian house on the main road and was founded in 1993. This was a time, when consciousness for the loss of culture and mentality after the migration of many Swabians grew. The Swabian house, which holds the museum, was built in 1881 after the great fire. It aims at a detailed reconstruction of the everyday life of Swabians of Petreşti in the lat 19th and early 20th century.